The Tag Heuer Aquaracer 500M Calibre 16: ready for the water. Price: $3,550. If you look online, better prices are sure to turn up. I found it for $2,512 on gemnation.com. 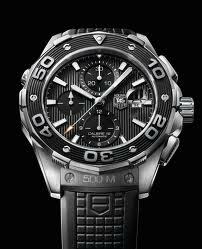 Tag Heuer is a favorite brand among celebrities such as Tiger Woods, Leonardo DiCapprio, Maria Sharapova, and Uma Thurman. The fact that they have chosen to wear Tag Heuer says something about the brand. It’s a very well-made watch, to say the least. But the added layer of status with Tag Heuer gives the consumer another thing to consider: “If I buy a Tag Heuer, am I buying the watch, or the name?” That’s up to you. The fact that watches are status symbols may influence your choice, or you may just really like everything about this Tag Heuer Aquaracer 500M Calibre 16 CAJ2110.FT6023 and couldn’t care less what Leo has on his nightstand. A word of warning: If you’ve never owned a watch like this before, be prepared for the responsibility of owning technical watch. I say “responsibility” because I think everyone should know how to work their own watch. The Aquaracer is like buying a nice camera: learning how to use all its functions might take some time. But once you know how to time a moving object and do other fancy stuff, you’re prepared to help out any regular watch-wearer in need. Although anyone can buy this watch as a high-end sports timepiece, I think this watch is best suited for divers and other water sports fanatics. With all its details and the Tag Heuer reputation, this Tag Heuer Aquaracer 500M Calibre 16 CAJ2110.FT6023 is worth the investment.